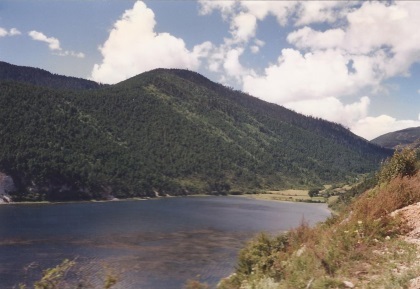 The Three Parallel Rivers of Yunnan Protected Areas represent a landscape of river gorges and high mountains. The areas are situated in Yunnan Province, south-west China. The site consists of 15 protected areas (in eight geographic clusters) in the mountainous northwest of the Province. It extends over a total area of 1.698.400 ha, encompassing the watershed areas of the Yangtse (Jinsha), Mekong (Lacang) and Salween (Nujiang) rivers. 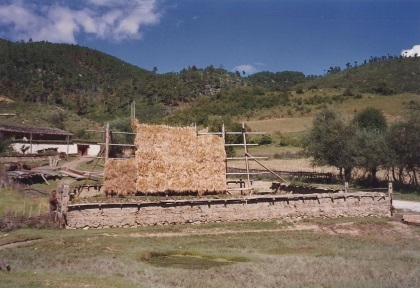 In 1994, I travelled around Yunnan Province for one month. It was one of the best trips of my life, and still at the right moment. Kunming was just starting to become a big, modern city and Lijiang and Dali saw the first influx of tourists. However, I did visit more remote places during that trip, of which Zhongdian stands out the most. We arrived after a long bustrip by night through the mountains. The air was thin, making the climb to the first floor of our hotel already difficult. In the next days we explored the surroundings. With a car and a female driver (I still clearly picture her immaculate white gloves) we went on a day trip to (what I now think was) Napa Hai. Writing this review, over 10 years later, the memories of the heavenly landscape all come back. The fresh mountain air, the endless views over the plateau, the yellow hey stacks, the rivers and lakes, numerous yaks. Still sunny in October, we enjoyed just strolling around, having small talk (the mime-type) with local women doing their laundry in the streams (members of the minority groups that populate this area). I have been hesitant to add this site to my Visited list, mainly because it's not very clear what exactly belongs to the "Three parallel rivers of Yunnan protected areas" and because I didn't write down the names of the places I visited in 1994. After some research I believe the place I went to was Napa Hai, and that is included in the protected areas. 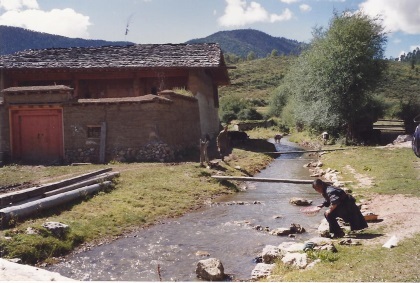 Zhongdian was renamed to Xianggelila a few years ago, marketing itself as the spot of James Hilton's mythical Shangri-La. The town itself certainly isn't, but its surrounding Tibetan countryside - well, it could be! The other reviews are all centred around the Yangtse river. But there are 3 rivers and the Salween in the far west is more remote and unspoilt. It takes 2 days to get to the best bits from Dali in the south but it's worth it. A real adventure!! It is not an easy site to visit. It is not easy to mark precisely what was really inscribed as three parallel rivers. There are no good maps available in Yunnan. I have to do a lot of paperwork before going there and found out that the easiest way to visit one of the inscribed areas is to go to Shangri-La (former Zhongdian) and try to reach the site from there. Shangri_la has its own charm (and it is good to stay there for some time, city is very interesting including old town, as well as surrounding countryside) and located nearby Podatso (Potatso) National Park which is part of Haba Snow Mountains Area and one of the inscribed UNESCOs. The park is 22 km from the town by good asphalf road. I am not sure about a public transport there but you can easily arrange a tour from Shangri-La or go there by bike (that I did). To get there it is about 2 hours (the road goes really through the mountains). Once you arrive at park entrance (visitors center) you should buy very expensive ticket to go through (in fact it was the most expensive entrance fee I have ever encounter in China - 190 Yuan). For that price you get free bus transportation inside the park and the possibility of perform different treks inside. The most popular is around Shudu Lake (approx. 4 km) and on the banks of Bita Lake (similar distance). The landscapes are amazing, be aware that you are located at the attitude over 3.500 meters above sea level. These sites are always hard to determine whether you have visited them. However my guide when I visited ShangriLa from Lijiang in October of 2008, confirmed that Tiger Leaping Gorge is part of Haba Snow Mountain and then in ShangriLa I visited the Potatso National Park and found that Bita Lake is located in the park. 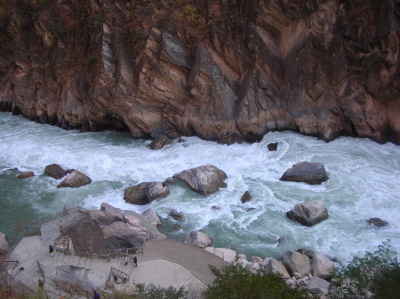 Both Tiger Leaping Gorge and Potatso Park are very popular local tourist sites and should be the destination for anyone who wants to check this WHS off their list. I've been twice in the last 20 months to this area because I found it so beautiful the first time (April 2004). But when I returned a few weeks ago (November 2005), I found so much development going on that I had the feeling one needs to travel quickly to this area before it loses all its natural charm. Very modern four and six-lane highways are being put up--wonderful in some regards, but isn't part of the romance of a place getting there? Modern, gleaming gas stations are springing up to support the road networks. China Mobile cell phone towers are everywhere, creating wonderful cell service but definitely not wanted in the scene view. The city of Dali seems to be in competition with the city of Lijiang; they're now building their own "old town completely with running spring". Zhongdian meanwhile is building its own new "old town" -- and all of these while featuring quaint cobbled streets and Naxi and Tibetan houses, sell the most dreadful tourist trinkets (plastic "Tibetan" beads, tin "silver jewelry", fake old coins, Tibetan "dreamcatchers", Naxi t-shirts, etc. etc.) We returned to a wonderful valley near Zhongdian to discover it had turned into a major construction site where they are building--yes! another new "old city" and a chairlift to haul hundreds of tourists daily up over the once pristine valleys and peaks. Pretty soon we'll probably have white water rafting camps along the rivers. Can't something be done to explain that these sites should be preserved, that they are a part of our natural heritage and heritage they already have (or had). You can't build heritage. What I discovered was the real culture being destroyed for a new Epcot style "cultural experience for tourists". Go quickly. Tectonic processes: Criterion (ix): .... An exceptional range of topographical features - from gorges to karst to glaciated peaks -- is associated with the property being at a "collision point" of tectonic plates. Glaciers: AB Review "The highest peak is Mt Kawagebo (6740 m), from which the southernmost glacier in China, Mingyongqia, descends to an altitude of 2700 m." ... This "is claimed to be the glacier descending to the lowest altitude for such a low latitude (28N) in the northern hemisphere"